This article is about Gateshead, England. For the suburb of Newcastle in Australia, see Gateshead, New South Wales. For the larger local government district, see Metropolitan Borough of Gateshead. Gateshead is a large town in Tyne and Wear, England, on the southern bank of the River Tyne opposite Newcastle upon Tyne. Gateshead and Newcastle are joined by seven bridges across the Tyne, including the Gateshead Millennium Bridge. The town is known for its architecture, including the Sage Gateshead, the Angel of the North and the Baltic Centre for Contemporary Art. Residents of Gateshead, like the rest of Tyneside, are referred to as Geordies. Gateshead's population in 2011 was 120,046. Historically part of County Durham, under the Local Government Act 1888 the town was made a county borough, meaning it was administered independently of the county council. Since 1974, the town has been administered as part of the Metropolitan Borough of Gateshead within the metropolitan county of Tyne and Wear. Gateshead is first mentioned in Latin translation in Bede's Ecclesiastical History of the English People as ad caput caprae ("at the goat's head"). This interpretation is consistent with the later English attestations of the name, among them Gatesheued (c. 1190), literally "goat's head" but in the context of a place-name meaning 'headland or hill frequented by (wild) goats'. Although other derivations have been mooted, it is this that is given by the standard authorities. There has been a settlement on the Gateshead side of the River Tyne, around the old river crossing where the Swing Bridge now stands, since Roman times. The first recorded mention of Gateshead is in the writings of the Venerable Bede who referred to an Abbot of Gateshead called Utta in 623. In 1068 William the Conqueror defeated the forces of Edgar the Ætheling and Malcolm king of Scotland (Shakespeare's Malcolm) on Gateshead Fell (now Low Fell and Sheriff Hill). During medieval times Gateshead was under the jurisdiction of the Bishop of Durham. At this time the area was largely forest with some agricultural land. The forest was the subject of Gateshead's first charter, granted in the 12th century by Hugh du Puiset, Bishop of Durham. An alternative spelling may be "Gatishevede", as seen in a legal record, dated 1430. William Hawks originally a blacksmith, started business in Gateshead in 1747, working with the iron brought to the Tyne as ballast by the Tyne colliers. Hawks and Co. eventually became one of the biggest iron businesses in the North, producing anchors, chains and so on to meet a growing demand. There was keen contemporary rivalry between 'Hawks' Blacks' and 'Crowley's Crew'. The famous 'Hawks' men' including Ned White, went on to be celebrated in Geordie song and story. Throughout the Industrial Revolution the population of Gateshead expanded rapidly; between 1801 and 1901 the increase was over 100,000. This expansion resulted in the spread southwards of the town. In 1854, a catastrophic explosion on the quayside destroyed most of Gateshead's medieval heritage, and caused widespread damage on the Newcastle side of the river. Robert Stirling Newall took out a patent on the manufacture of wire ropes in 1840 and in partnership with Messrs. Liddell and Gordon, set up his headquarters at Gateshead. A worldwide industry of wire-drawing resulted. The submarine telegraph cable received its definitive form through Newall's initiative, involving the use of gutta percha surrounded by strong wires. The first successful Dover-Calais cable on 25 September 1851, was made in Newall's works. In 1853, he invented the brake-drum and cone for laying cable in deep seas. Half of the first Atlantic cable was manufactured in Gateshead. Newall was interested in astronomy, and his giant 25-inch (640 mm) telescope was set up in the garden at Ferndene, his Gateshead residence, in 1871. In 1831 a locomotive works was established by the Newcastle and Darlington Railway, later part of the York, Newcastle and Berwick Railway. In 1854 the works moved to the Greenesfield site and became the manufacturing headquarters of North Eastern Railway. In 1909, locomotive construction was moved to Darlington and the rest of the works were closed in 1932. Sir Joseph Swan lived at Underhill, Low Fell, Gateshead from 1869–83, where his experiments led to the invention of the electric light bulb. The house was the first in the world to be wired for domestic electric light. In 1835, Gateshead was established as a municipal borough and in 1889 it was made a county borough, independent from Durham County Council. In the same year, however, one of the largest employers, Hawks, Crawshay and Company, closed down and unemployment has since been a burden. Up to the Second World War there were repeated newspaper reports of the unemployed sending deputations to the council to provide work. The depression years of the 1920s and 1930s created even more joblessness and the Team Valley Trading Estate was built in the mid-1930s to alleviate the situation. 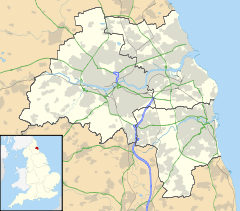 In 1974, following the Local Government Act 1972, the County Borough of Gateshead was merged with the urban districts of Felling, Whickham, Blaydon and Ryton and part of the rural district of Chester-le-Street to create the much larger Metropolitan Borough of Gateshead. The town of Gateshead is situated in the North East of England in the ceremonial county of Tyne and Wear, and within the historic boundaries of County Durham. It is located on the southern bank of the River Tyne at a latitude of 54.57° N and a longitude of 1.35° W. Gateshead experiences a temperate climate which is considerably warmer than some other locations at similar latitudes as a result of the warming influence of the Gulf Stream (via the North Atlantic drift). It is located in the rain shadow of the North Pennines and is therefore in one of the driest regions of the United Kingdom. One of the most distinguishing features of Gateshead is its topography. The land rises 230 feet from Gateshead Quays to the town centre and continues rising to a height of 525 feet at Queen Elizabeth Hospital in Sheriff Hill. This is in contrast to the flat and low lying Team Valley located on the western edges of town. The high elevations allow for impressive views over the Tyne valley into Newcastle and across Tyneside to Sunderland and the North Sea from lookouts in Windmill Hills and Windy Nook respectively. The Office for National Statistics defines the town as an urban sub-division. The latest (2011) ONS urban sub-division of Gateshead contains the historical County Borough together with areas that the town has absorbed, including Dunston, Felling, Heworth, Pelaw and Bill Quay. Given the proximity of Gateshead to Newcastle, just south of the River Tyne from the city centre, it is sometimes incorrectly referred to as being a part of Newcastle. Gateshead Council and Newcastle City Council teamed up in 2000 to create a unified marketing brand name, NewcastleGateshead, to better promote the whole of the Tyneside conurbation. Climate in this area has small differences between highs and lows, and there is adequate rainfall year-round to meet the criterion for Oceanic climate, at least 30 mm per month. The Köppen Climate Classification subtype for this climate is "Cfb" (Marine West Coast Climate/Oceanic climate). The town is within the wider Tyne & Wear Green Belt, with its portion in much of its surrounding rural area of the borough. It is a part of the local development plan which is in conjunction with Newcastle city borough, and was created in the 1960s. In the Gateshead borough boundary, as well as the aforementioned areas, it also surrounds the communities of Chopwell, Crawcrook, Greenside, High Spen, Kibblesworth, Lockhaugh, Rowlands Gill, Ryton, Sunniside, as well several small hamlets. Landscape features and facilities such as woods and nature reserves, local golf courses, Burdon Moor and Whinell Hill are also within the green belt area. The town of Gateshead consists of the following districts. Some of them were once separate settlements that were absorbed by encroaching urban sprawl, while others consist entirely of retail, industrial and housing estates. Many of these areas overlap each other and their boundaries are by no means official or fixed. Gateshead is a Town (Urban Subdivision) in the Tyneside urban area. In 2011, 8.0% of the population of Gateshead Town were from an ethnic minority group (non-white British), compared with only 6.0% for the surrounding borough. Despite the borough's low ethnic minority population compared with the England average of 20.2%, it has slightly more ethnic minorities than other boroughs in Tyne and Wear, such as Sunderland or North Tyneside, and two wards near the town centre (Bridges and Saltwell) have minority populations very similar to the national average. The Tyneside metropolitan area, which contains the borough of Gateshead, has a population of 829300; the NewcastleGateshead urban core area has population of 480400. The Metropolitan borough of Gateshead had a population of 200,214 in 2011. Gateshead is the main major area in the metropolitan borough and the town takes up around 60% of the borough's population. Other major areas in the borough include Whickham, Birtley, Blaydon-on-Tyne and Ryton. The Team Valley Trading Estate, initially the largest and still one of the larger purpose-built commercial estates in the United Kingdom, is in Gateshead. JB Priestley, writing of Gateshead in his travelogue English Journey (1934) said that "no true civilisation could have produced such a town", adding that it appeared to have been designed "by an enemy of the human race". This dismal impression, typical of the author's view of industrial towns, has proved influential in defining the popular image of Gateshead. Much, however, has changed since his time. William Wailes the celebrated stained-glass maker, lived at South Dene from 1853-60. In 1860, he designed Saltwell Towers as a fairy-tale palace for himself. It is an imposing Victorian mansion in its own park with a romantic skyline of turrets and battlements. It was originally furnished sumptuously by Gerrard Robinson. Wailes sold it to the corporation in 1876 for use as a public park, provided he could use the house for the rest of his life. For many years the structure was essentially an empty shell but following a restoration programme it was reopened to the public in 2004. The brutalist Trinity Centre Car Park, which was designed by Owen Luder, dominated the town centre for many years until its demolition in 2010. A product of attempts to regenerate the area in the 1960s, the car park gained an iconic status due to its appearance in the 1971 film Get Carter, starring Michael Caine. An unsuccessful campaign to have the structure listed was backed by Sylvester Stallone, who played the main role in the 2000 remake of the film. The car park was scheduled for demolition in 2009, but this was delayed as a result of a disagreement between Tesco (who plan to re-develop the site) and Gateshead Council. The council had not been given firm assurances that Tesco would build the previously envisioned town centre development which was to include a Tesco mega-store as well as shops, restaurants, cafes, bars, offices and student accommodation. The council effectively used the car park as a bargaining tool to ensure that the company adhered to the original proposals and blocked its demolition until they submitted a suitable planning application. Demolition finally took place in July–August 2010. The Derwent Tower, another well known example of brutalist architecture, was also designed by Owen Luder and stood in the neighbourhood of Dunston. Like the Trinity Car Park it also failed in its bid to become a listed building and was demolished in 2012. Also located in this area are the Grade II listed Dunston Staithes which were built in 1890. Following the award of a Heritage Lottery Fund grant of almost £420,000 restoration of the structure is expected to begin in April 2014. The council has recently sponsored the development of the Gateshead Quays cultural quarter. The development includes the Gateshead Millennium Bridge, erected in 2001, which won the James Stirling Prize for Architecture in 2002. The Baltic Centre for Contemporary Art has been established in a converted flour mill. The Sage Gateshead, a Norman Foster-designed venue for music and the performing arts opened on 17 December 2004. Gateshead also hosted the Gateshead Garden Festival in 1990, rejuvenating 200 acres (0.81 km2) of derelict land (now mostly replaced with housing). The Angel of the North, a famous sculpture in nearby Lamesley, is visible from the A1 to the south of Gateshead, as well as from the East Coast Main Line. Other public art include works by Richard Deacon, Colin Rose, Sally Matthews, Andy Goldsworthy, Gordon Young and Michael Winstone. The Gateshead Millennium Bridge won the prestigious Stirling Prize for Architecture in 2002. Gateshead International Stadium regularly holds international athletics meetings over the summer months. It is also host to rugby league fixtures, and the home ground of Gateshead Football Club. Gateshead Thunder Rugby League Football Club played at Gateshead International Stadium until its purchase by Newcastle Rugby Limited and the subsequent rebranding as Newcastle Thunder. Both clubs have had their problems: Gateshead A.F.C. were controversially voted out of the Football League in 1960 in favour of Peterborough United, whilst Gateshead Thunder lost their place in Super League as a result of a takeover (officially termed a merger) by Hull F.C. Both Gateshead clubs continue to ply their trade at lower levels in their respective sports, thanks mainly to the efforts of their supporters. The Gateshead Senators American Football team also use the International Stadium, as well as this it was used in the 2006 Northern Conference champions in the British American Football League. Gateshead Miners are Gateshead's first and only Aussie Rules Football team and compete in the Aussie Rules UK National League. In Low Fell there is a cricket club and a rugby club adjacent to each other on Eastwood Gardens. These are Gateshead Fell Cricket Club and Gateshead Rugby Club. Gateshead Rugby Club was formed in 1998 following the merger of Gateshead Fell Rugby Club and North Durham Rugby Club. Tyne & Wear Metro stations at Gateshead Interchange and Gateshead Stadium provide direct light-rail access to Newcastle station, Newcastle Airport, Sunderland, Tynemouth and South Shields. Gateshead Interchange is the busiest bus station in Tyne & Wear and was used by 3.9 million bus passengers in 2008. National Rail services are provided by Northern at Dunston and MetroCentre stations. The East Coast Main Line, which runs from London King's Cross to Edinburgh Waverley, cuts directly through the town on its way between Newcastle and Chester-le-Street stations. There are presently no stations on this line within Gateshead, as Low Fell, Bensham and Gateshead West stations were closed in 1952, 1954 and 1965 respectively. Various bicycle trails traverse the town, most notably the recreational Keelmans Way (National Cycle Route 14), which is located on the south bank of the Tyne and takes riders along the entire Gateshead foreshore. Other prominent routes include the East Gateshead Cycleway, which connects to Felling, the West Gateshead Cycleway, which links the town centre to Dunston and the MetroCentre, and routes along both the old and new Durham roads, which take cyclists to Birtley, Wrekenton and the Angel of the North. Gateshead is served by the following rail transport stations with some being operated by National Rail and some being Tyne & Wear Metro stations. In the 2001 Census, more than 10% of people residing in the wider Metropolitan Borough of Gateshead stated that they practiced no religion. Christianity has been present in the town since at least the 7th century, when Bede mentioned a monastery in Gateshead. A church in the town was burned down in 1080 with the Bishop of Durham inside. [citation needed] St Mary's Church was built near to the site of that building, and was the only church in the town until the 1820s. Undoubtedly the oldest building on the Quayside, St Mary's has now re-opened to the public as the town's first heritage centre. The Bensham district is home to a community of hundreds of Jewish families and used to be known as "Little Jerusalem". Within the community is the Gateshead Yeshiva, founded in 1929, and other Jewish educational institutions with international enrollments, such as Sunderland Yeshiva, Yeshiva Ketana, Beer Hatorah, Sunderland Kibutz, Yeshiva Gedola, Nezer Hatorah and Nesivos Hatorah. An article in The Daily Telegraph stated that a woman was denied entry into the UK at some time prior to 2007 for giving her reason for visiting as wanting to go to Gateshead. British visa officials ruled this as "not credible". The research into Britain's confused immigration policies was taken up by Steve Boggan in The Guardian in a piece dated 23 January 2007, which expressed incredulity at the ignorance of London officials, echoed by Newcastle-Gateshead tourism heads. ^ a b "KS201EW (Ethnic group) - Nomis - Official Labour Market Statistics". www.nomisweb.co.uk. Archived from the original on 22 October 2016. Retrieved 8 May 2018. ^ a b c d "Gateshead County Borough". nationalarchives.gov.uk. Tyne and Wear Archives. Archived from the original on 23 November 2016. Retrieved 23 November 2016. In 1974, under the 1972 Local Government Act Gateshead County Borough merged with... to form Gateshead Metropolitan Borough Council (see MD/GA). ^ Bethany Fox, The P-Celtic Place-Names of North-East England and South-East Scotland, The Heroic Age, 10 (2007), "Archived copy". Archived from the original on 11 January 2018. Retrieved 9 January 2018. CS1 maint: Archived copy as title (link) (appendix at "Archived copy". Archived from the original on 9 May 2016. Retrieved 23 May 2016. CS1 maint: Archived copy as title (link)). ^ a b Mawer, Allen (1920). The Place-names of Northumberland and Durham. Cambridge. p. 92. ^ Plea Rolls of the Court of Common Pleas; CP 40 / 677; National Archives; "Archived copy". Archived from the original on 18 May 2013. Retrieved 28 January 2013. CS1 maint: Archived copy as title (link); last entry on the image, the home of William Philypson, a tanner. ^ "First shots revealed of Gateshead's future". The Evening Chronicle. 17 December 2008. Archived from the original on 20 December 2008. Retrieved 17 December 2008. ^ Wood, Kerry (24 May 2013). "Gateshead's £150m Trinity Square is officially opened". nechronicle. Archived from the original on 17 July 2014. ^ Metcalfe, Will (1 September 2014). "Get Carter carpark replacement Trinity Square up for 'ugliest building' award". nechronicle. Archived from the original on 3 September 2014. ^ "'Inept' Tesco complex voted UK's ugliest building". BT.com. Archived from the original on 4 September 2014. ^ "Layout 1" (PDF). Archived (PDF) from the original on 27 February 2012. Retrieved 7 November 2012. ^ "Windy Nook Nature Park Local Nature Reserve". Gateshead.gov.uk. Archived from the original on 6 June 2012. Retrieved 22 May 2012. ^ "Travel Weather Averages (Weatherbase)". Weatherbase. ^ [not in citation given] "Weatherbase.com". Weatherbase. 2013. Archived from the original on 12 July 2013. Retrieved 10 July 2013. ^ "Planning for the Future Core Strategy and Urban Core Plan for Gateshead and Newcastle upon Tyne 2010-2030 - Adopted March 2015" (PDF). www.newcastle.gov.uk. Archived (PDF) from the original on 16 January 2018. ^ "Core Strategy and Urban Core Plan - Section 3 Strategic Policies - Chapter 12 People and Place" (PDF). www.newcastle.gov.uk. Archived (PDF) from the original on 22 January 2018. ^ "Gateshead (Tyne and Wear, North East England, United Kingdom) - Population Statistics and Location in Maps and Charts". www.citypopulation.de. Archived from the original on 23 February 2016. Retrieved 25 March 2016. ^ a b Services, Good Stuff IT. "Gateshead - UK Census Data 2011". UK Census Data. Archived from the original on 8 May 2018. Retrieved 8 May 2018. ^ Services, Good Stuff IT. "England - UK Census Data 2011". UK Census Data. Archived from the original on 8 May 2018. Retrieved 8 May 2018. ^ Leatherdale, Duncan (26 November 2014). "Playwright Priestley's 'grim' north". Archived from the original on 5 September 2017. Retrieved 8 May 2018 – via www.bbc.co.uk. ^ "Fairytale mansion gets new life". BBC News. 14 July 2004. Archived from the original on 10 June 2009. ^ "FOI 106152 released information" (PDF). Archived from the original (PDF) on 4 March 2012. Retrieved 7 November 2012. ^ Collett, Christopher (10 April 2008). "Good Riddance to the Gateshead Multi-Storey Car Park". Metro.co.uk. Archived from the original on 30 September 2012. Retrieved 22 May 2012. ^ "Historic car park finally closes". BBC News. 5 January 2009. Retrieved 2 April 2010. ^ a b Pearson, Adrian (14 December 2009). "Council blocks Get Carter car park demolition". ChronicleLive. Archived from the original on 1 May 2010. Retrieved 22 May 2012. ^ "Dunston Rocket will not be listed by English Heritage". ChronicleLive. 30 October 2009. Archived from the original on 27 May 2010. Retrieved 22 May 2012. ^ "Gateshead's Dunston Staithes could be opened to public". BBC News. Archived from the original on 16 March 2014. ^ "RIBA Stirling Prize Winners". architecture.com. Archived from the original on 28 September 2014. ^ "Gateshead Fell Cricket Club". the-fell.co.uk. Archived from the original on 16 August 2014. ^ "Gateshead RC". Archived from the original on 19 December 2014. ^ "Gateshead Rugby Club". Archived from the original on 9 January 2015. ^ "2 Related Thesaurus Terms". Isee.gateshead.gov.uk. Archived from the original on 3 March 2012. Retrieved 22 May 2012. ^ "Cycle Gateshead - The Definitive Guide". Cycle-routes.org. Archived from the original on 13 September 2012. Retrieved 22 May 2012. ^ "Cycle Gateshead - Keelman's Way Introduction". Cycle-routes.org. Archived from the original on 29 February 2012. Retrieved 22 May 2012. ^ "Cycle Gateshead - East Gateshead Cycleway". Cycle-routes.org. Archived from the original on 29 February 2012. Retrieved 22 May 2012. ^ "Cycle Gateshead - West Gateshead Cycleway". Cycle-routes.org. Archived from the original on 29 February 2012. Retrieved 22 May 2012. ^ "Cycle Gateshead - Durham Roads". Cycle-routes.org. Archived from the original on 29 February 2012. Retrieved 22 May 2012. ^ "St. Mary's Heritage Centre - Heritage / Visitor Centre in Gateshead, Gateshead - NewcastleGateshead". www.newcastlegateshead.com. Retrieved 8 May 2018. ^ "Gateshead Churches - Anglican". picturesofgateshead.co.uk. Archived from the original on 3 March 2016. ^ ""Famous Old Tyneside Community Set for a New Look.Again" - Evening Chronicle (Newcastle, England), November 22, 2014 - Online Research Library: Questia". www.questia.com. Archived from the original on 25 June 2017. Retrieved 8 May 2018. ^ Mitchell, Bruce (8 May 2018). "Language Politics and Language Survival: Yiddish Among the Haredim in Post-war Britain". Peeters Publishers. Archived from the original on 8 May 2018. Retrieved 8 May 2018 – via Google Books. ^ Bloxham, Andy (20 June 2008). "Celebrities refused entry to Britain". The Daily Telegraph. London. Archived from the original on 2 April 2012. Retrieved 14 November 2011. ^ Boggan, Steve (23 January 2007). "Come to lovely Gateshead - if you can get past immigration". The Guardian. London. Archived from the original on 3 January 2014. Retrieved 14 November 2011. ^ McLean, Gareth (9 August 2002). "The voice of Big Brother". The Guardian. London. Archived from the original on 9 July 2017. ^ "International Heritage Centre". salvationarmy.org.uk. Archived from the original on 24 July 2014. ^ "Commemorative Plaques in Gateshead Borough". bpears.org.uk. Archived from the original on 26 July 2013. ^ Plater, Alan (17 May 2001). "Obituary: Alex Glasgow". the Guardian. Archived from the original on 9 July 2017. Retrieved 8 May 2018. ^ "Why do they keep trotting out this Looney idea about Shakespeare?". The Daily Telegraph. London. 22 October 2011. Archived from the original on 27 May 2016. ^ Stuff, Good. "William Shield blue plaque in Gateshead". www.blueplaqueplaces.co.uk. Archived from the original on 16 January 2017. Retrieved 8 May 2018. ^ "Background; Sir Joseph Swan Centre for Energy Research; Newcastle University". ncl.ac.uk. Archived from the original on 14 October 2014. ^ "Sylvia Waugh". www.penguin.co.uk. Archived from the original on 16 January 2017. Retrieved 8 May 2018.